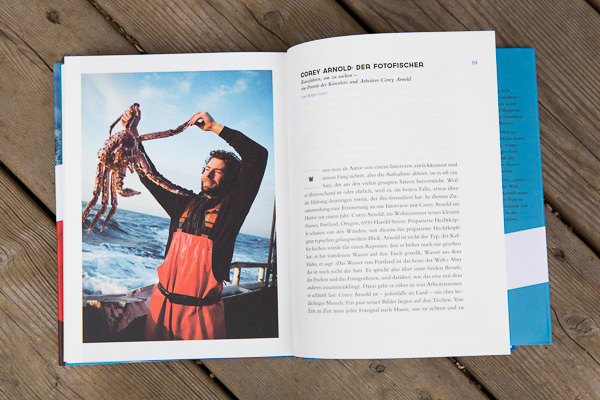 Recently I was nominated for a LEAD Academy award in Germany for the Photo Reportage of the Year Award for the publishing of my Fish-Work Series in MARE Magazine and also in DUMMY magazine in 2012. The Lead Awards are the top honors in Germany for this kind of work. 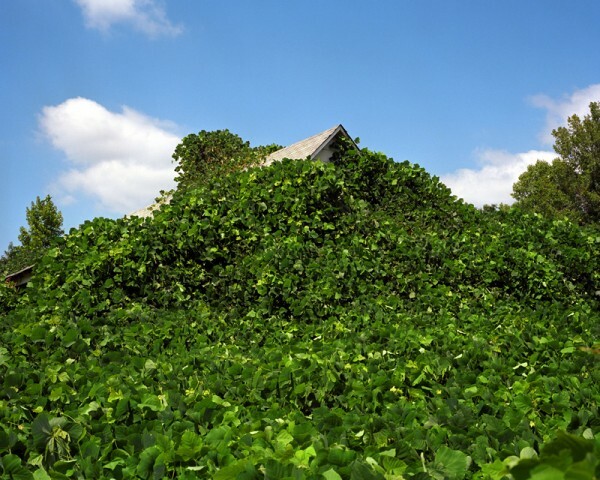 As one of 3 finalists, the work was included in an exhibition at the beautiful House of Photography in Hamburg. The show is up through October and the awards will be given out September 13th. You can see my wall in the photo below, second to left. Very nice honor, thanks Germany! The Best of Magazine and Internet Photography, Advertising, Online, and Editorial Design – Showcasing Creative Talent. 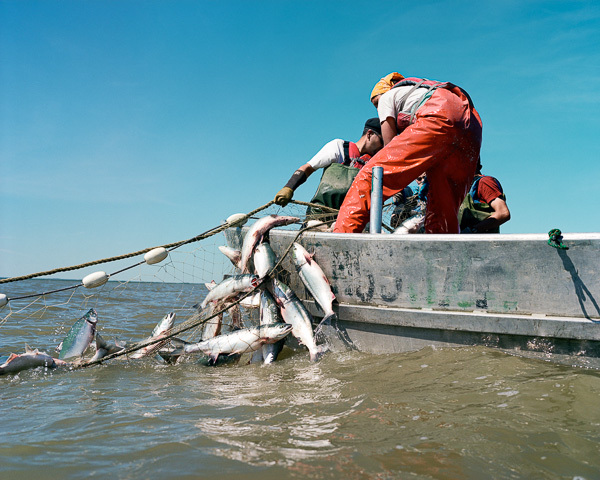 This entry was posted in Art Shows, Awards/ Honors, Fishing Related, Press Reports and tagged award, commercial, coreyfishes, crab, crabbing, deadliest catch, deutschland, discovery, Dummy, exhibition, fishing, Mare, photographer, photography, sea, tyskland. 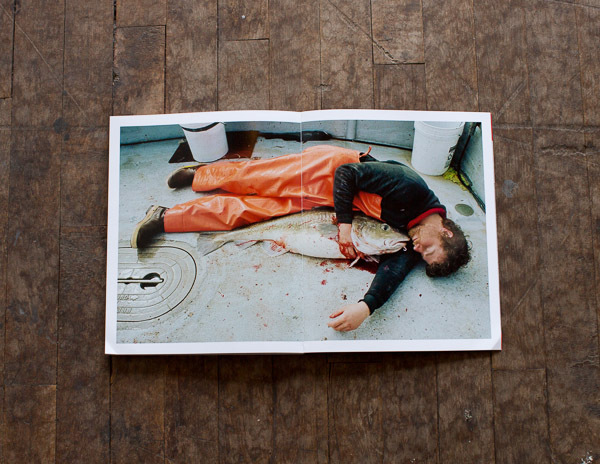 Brooklyn based Photo Industries recently curated a selection from my Fish-Work Bering Sea series for an exhibition on one of the East River Ferries in New York City. Here is a link to the show. The show was up and came down in July while I was off in Alaska but here are a few pics! Thanks to Sam Barzilay for the invitation. 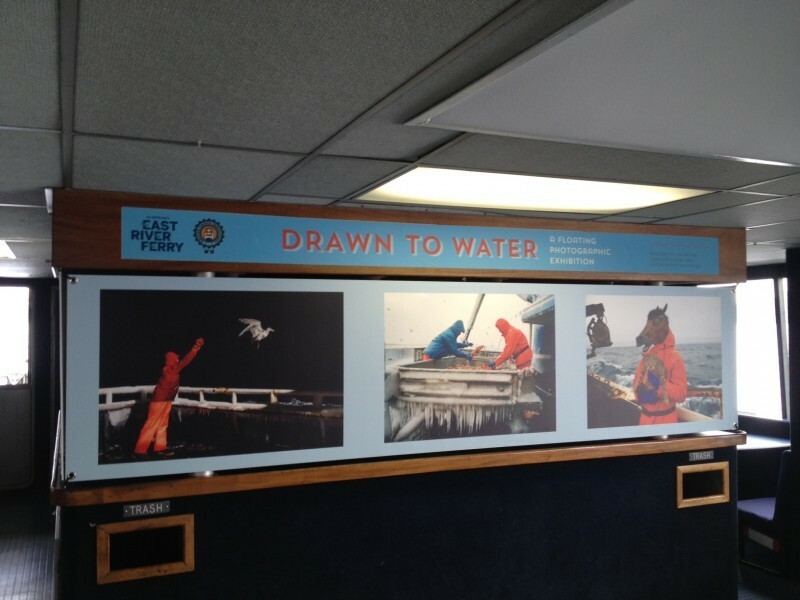 This entry was posted in Art Shows, Awards/ Honors, Press Reports and tagged arni_coraldo, art, bird, commercial, coreyfishes, deadliest catch, exhibition, Ferry, fish-work, fishing, freedom, horse, ice, kitty, new york, ocean, sea, water. Coming your way from Brazil, ZUPI #34! 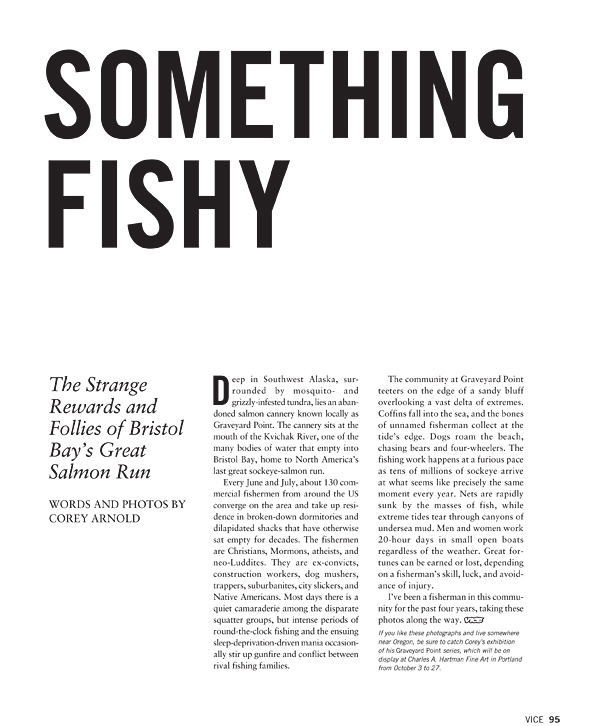 Excited to have a 4 page selection of Fish-Work included in this lovely little art mag. 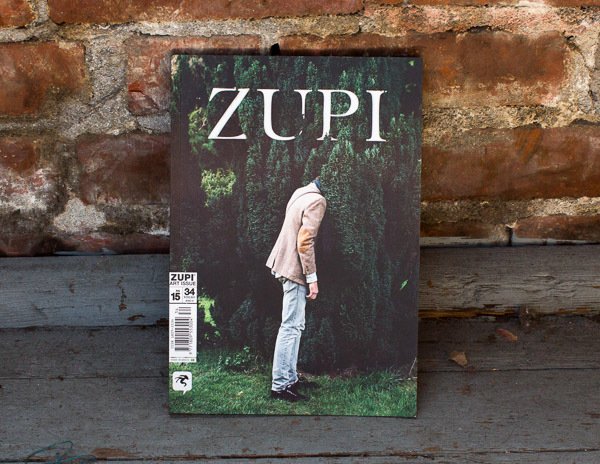 ZUPI #34, Brazil. Photo: Corey Arnold. 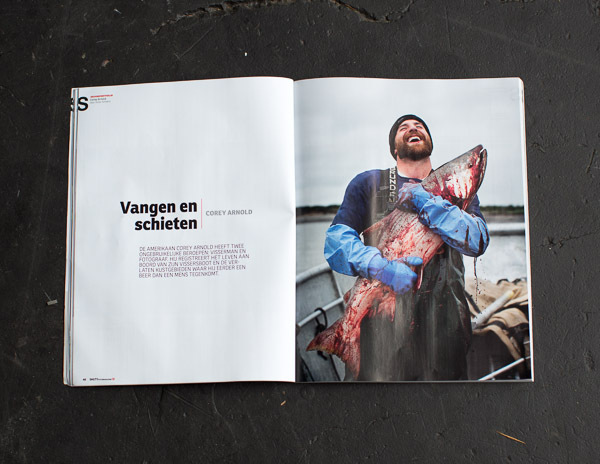 This entry was posted in Fishing Related, Press Reports and tagged Alaska, art, corey arnold, coreyfishes, fish, fisherman, fishing, magazine, photo, photographer, photography, pictures, salmon, sea, water, wave. 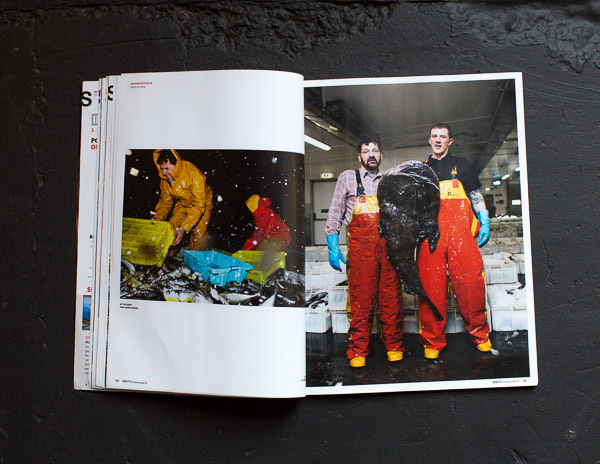 EXIT #49, an art magazine based in Madrid, Spain included a 9 page spread of images from Fish-Work as well as the Fishing With My Dad series. This is a really beautiful mag. Thanks ya’ll. Below are a few sample spreads. The crotch cover shot is not mine. EXIT #49, Spain. 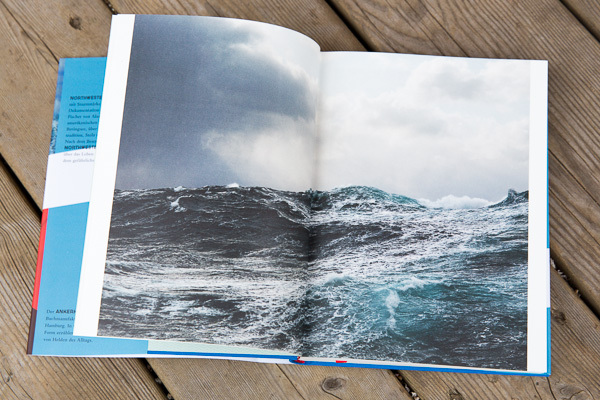 Photos: Corey Arnold. EXIT #49, Spain. Photo: Corey Arnold. 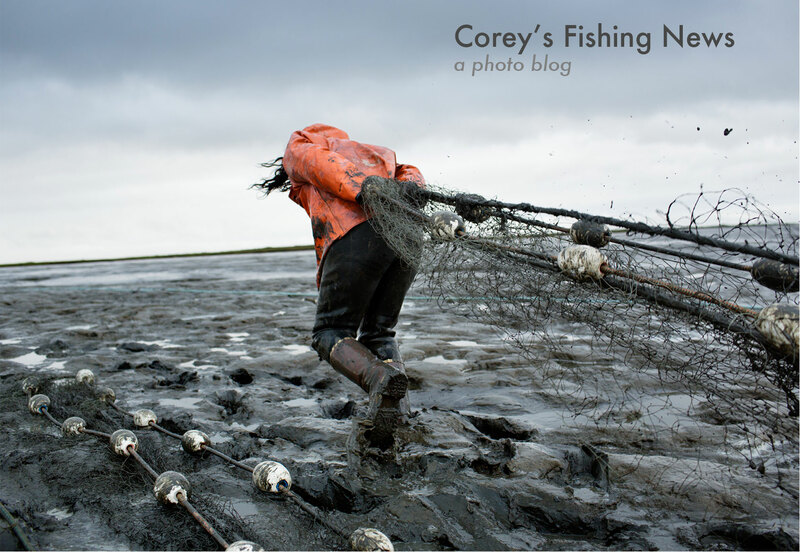 This entry was posted in Fishing Related, Press Reports and tagged Alaska, arnold, art, bering sea, commercial, corey arnold, coreyfishes, crabbing, fish, fisherman, fishing, magazine, ocean, photo, photographer, photography, pictures, sea, spain, water, wave. 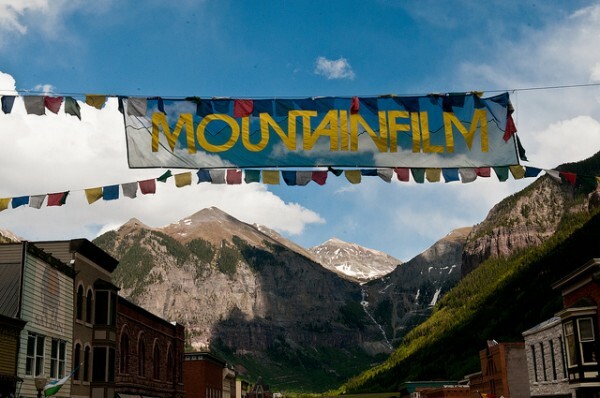 A selection of 12 Fish-Work images from over the years will be on display at this weekend’s 35th annual Mountain Film Festival in Telluride. I’m honored to have been invited by a great photographer and Telluride local Drew Ludwig. My work will be on display at the Telluride Gallery of Fine Art and the opening is Friday, May 24th 3:30-6:30. The festival is on from May 24-27. Going to be a nuts weekend of good times. 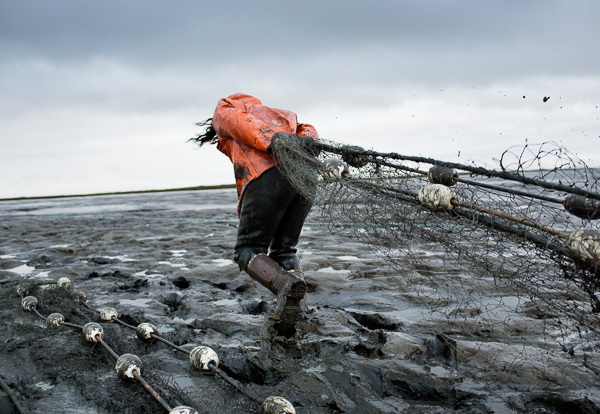 This entry was posted in Art Shows, Awards/ Honors and tagged Alaska, arnold, colorado, commercial fishing, corey, coreyfishes, exhibition, exhibitions, Festival, Film, graveyard point, mountain, pebble mine. This winter I gave an interview with Victor Schiferli for Dutch photography magazine SHUTR #02. 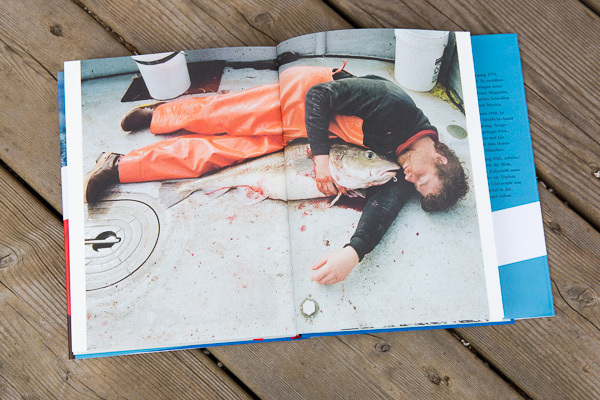 The 12 page spread includes some real Fish Work classics! Thrilled to be included. 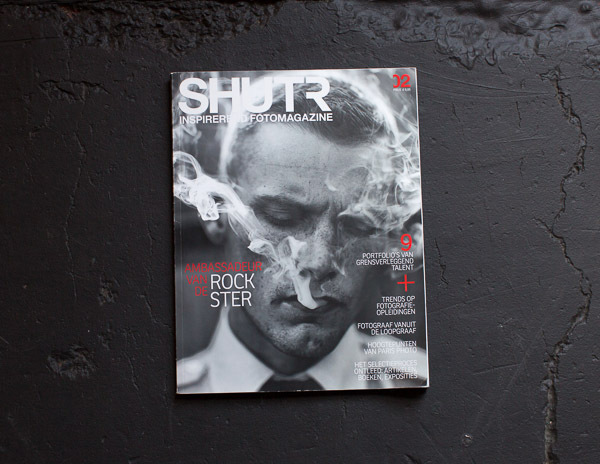 SHUTR Fotomagazine #02, Netherlands. Photo: Corey Arnold. 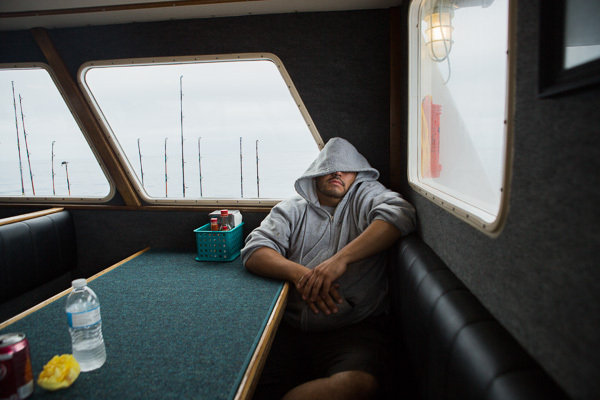 This entry was posted in Fishing Related, Press Reports and tagged Alaska, art, catch, commercial, corey arnold, coreyfishes, Europe, fish, fisherman, fishing, interview, ocean, photo, photographer, photography, pictures, salmon, sea, water, wave, work. Kite Power for the New Yorker Magazine! 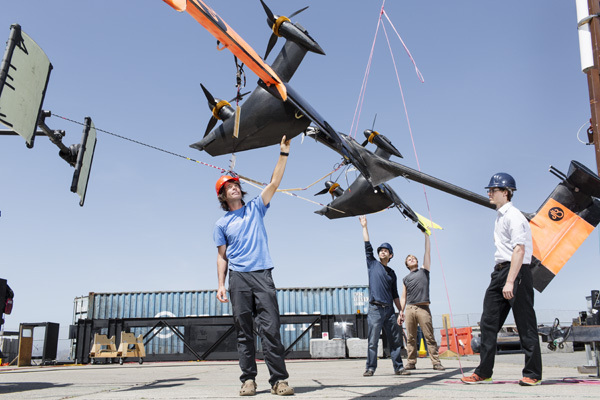 A couple weeks back, The New Yorker sent me to Alameda, California to photograph the man behind several amazing kite powered projects in the works. 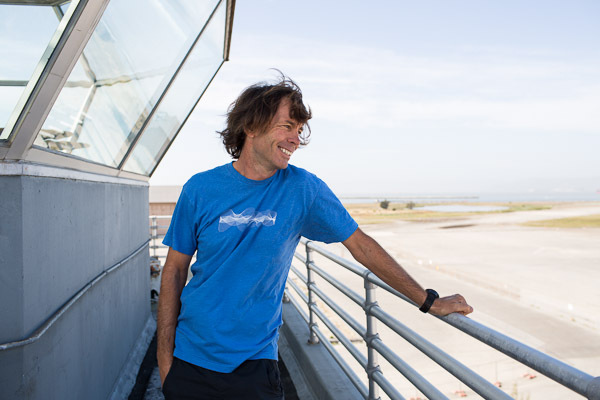 Don Montague is one of the founding innovators of windsurfing and kiteboarding. 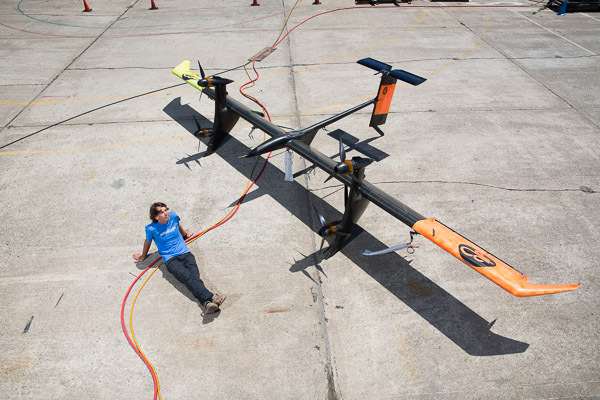 He is also the founder/CEO of Makani Power, a startup that has developed a hi tech power generating kite. 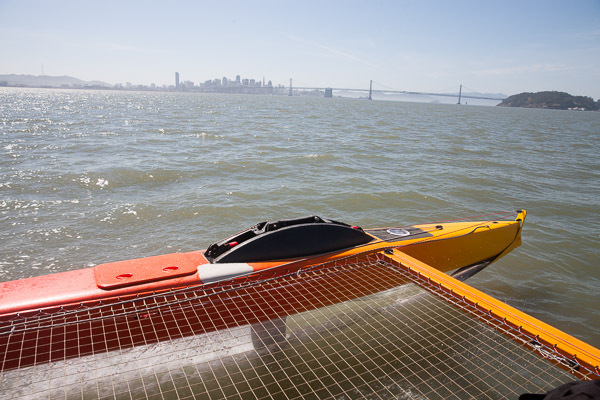 I spent the day with Don and the Makani Power engineers, then headed out for a spin around San Francisco Bay on another one of Don’s inventions/experiments: the kiteboat. 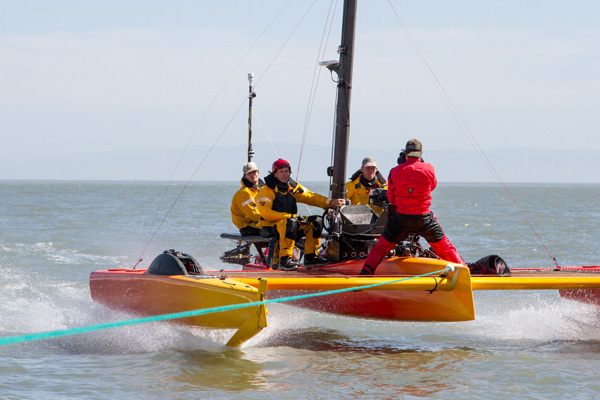 Imagine a trimaran hydrofoil with a huge kitesurfing type kite pulling us at 30 knots around the bay. Needless to say, photographing at that speed was a mess, but the whole experience was the highlight of my spring. 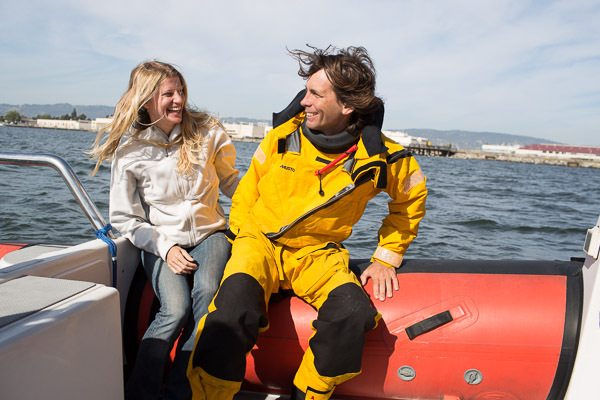 Attached are some outtakes from the shoot and here is a link to a behind the scenes gallery by Betsy Pfeiffer including GoPro shots from the kite and the boat during the trip. Thanks to Betsy and also to Andrea Dunlap for the behind the scenes Makani Power photos. 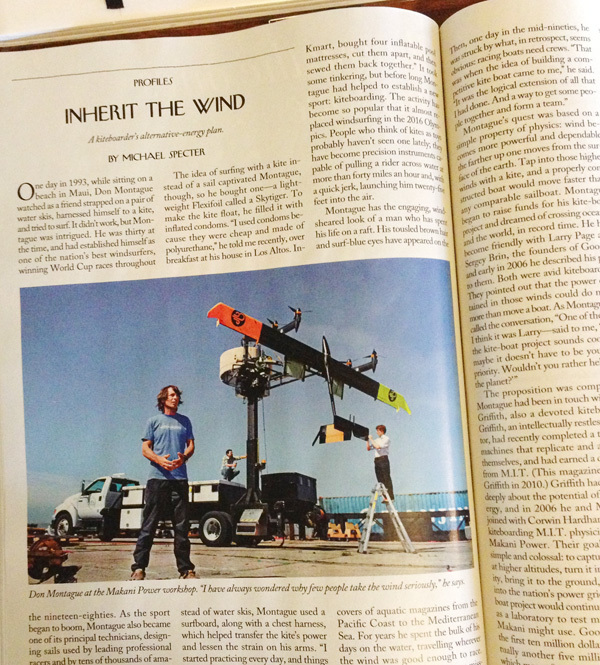 “Inherit the Wind”, the story written by Michael Spector can be found in the May 20, 2013 issue of The New Yorker. 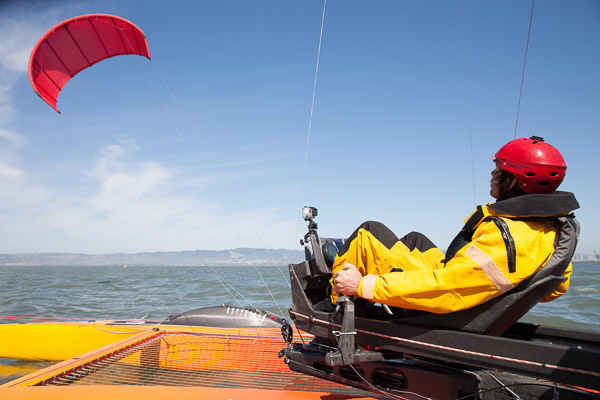 Don Montague and the Makani Power Kite. 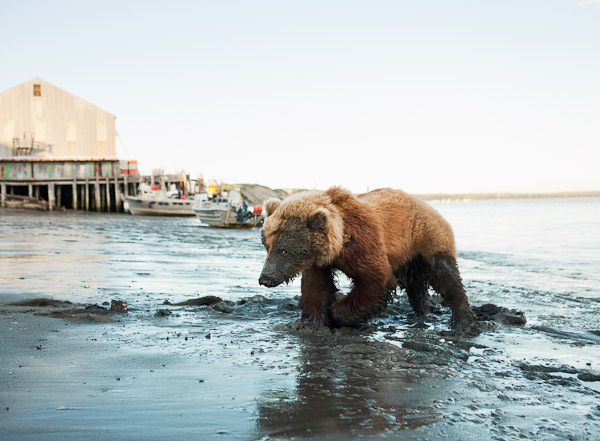 Photo by Corey Arnold for the New Yorker Magazine. 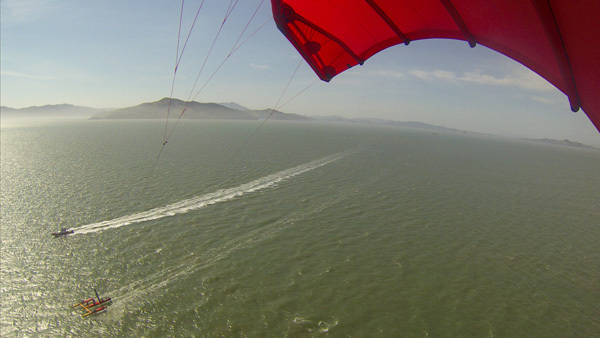 GoPro shot from the kiteboat kite during our trip. This entry was posted in Awards/ Honors, Press Reports, travel journals and tagged arnold, best of, breeze, corey, coreyfishes, Don Montague, editorial, energy, engineer, future, google, kite, kiteboarding, kitesurfing, makani, manaki, photographer, photography, portfolio, power, sea, tubine, windpower. 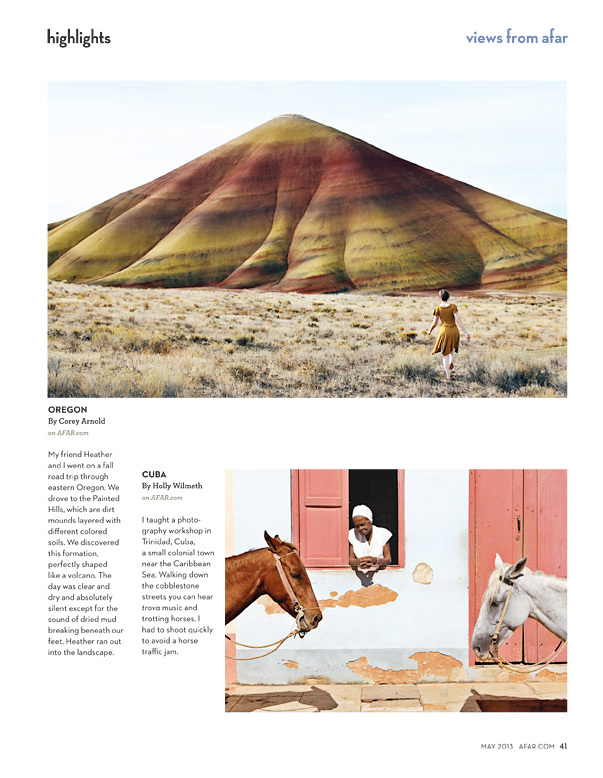 One of my photographs from a trip to the Painted Hills in Eastern Oregon is out now in AFAR Magazine, the May 2013 issue. 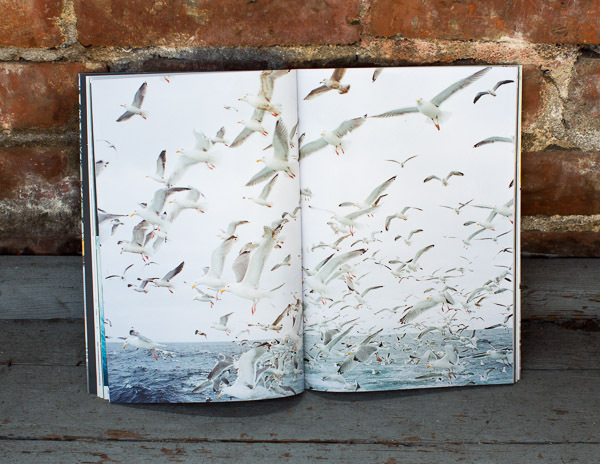 Heather's Walk, top photo by Corey Arnold for Afar Magazine. This entry was posted in Press Reports, travel journals and tagged coreyfishes, desert, dress, eastern, fall, Fashion, frolicking, girl, heather treadway, hill, john day fossil, mountain, oregon, outdoor, painted hills, photography, running, striped. If you ever watched the Discovery Channel’s Deadliest Catch, then you are surely familiar with the f/v Northwestern captained by the infamous Sig Hansen. 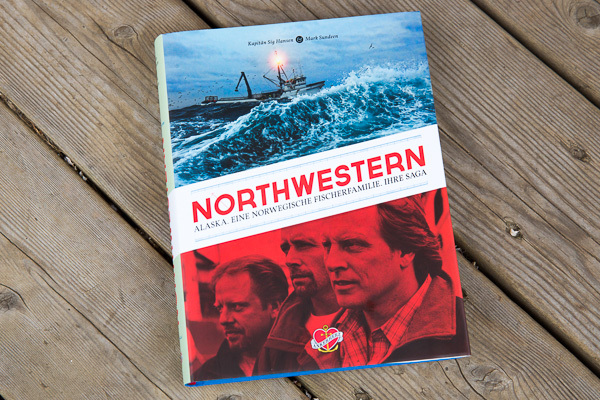 Some years ago, the story of the Northwestern appeared on the market in book form entitled “North by Northwestern” written by Mark Sundeen. 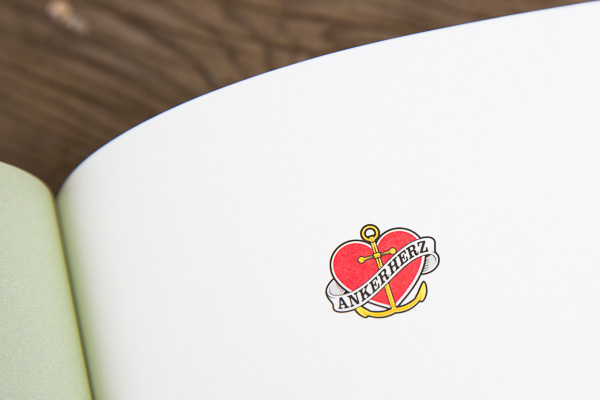 Recently, a German translation edition was released by Ankerherz Verlag. 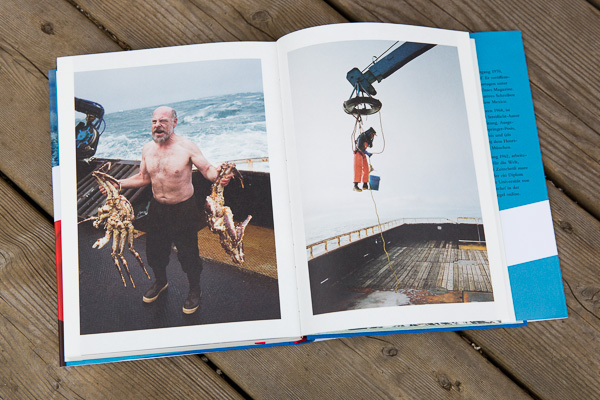 Ankerherz chose a portfolio of my Fish-Work Bering Sea series to illustrate the book which also includes a lengthy interview with me by Holger Gertz a journalist with Süddeutsche Zeitung. 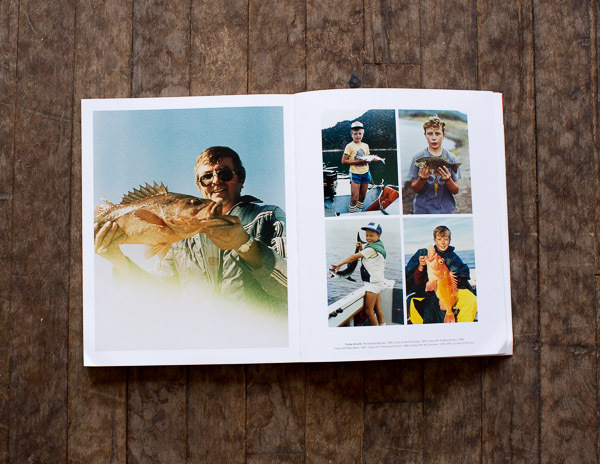 The design of the book is absolutely beautiful… and appears more that of an art book, then a biography of the most famous fishing family on Television. Thanks to Stefan and Julia Krücken for including my work in the project. 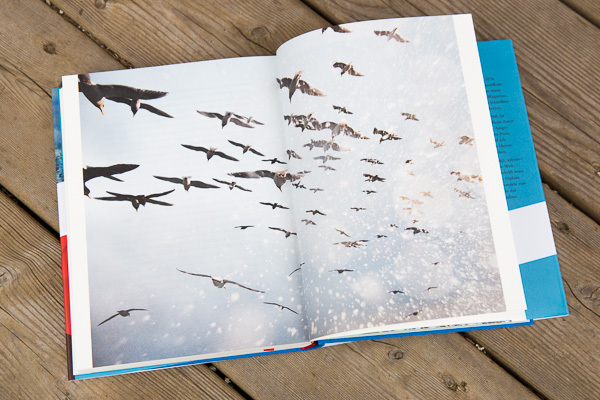 Here are some select spreads from the book. 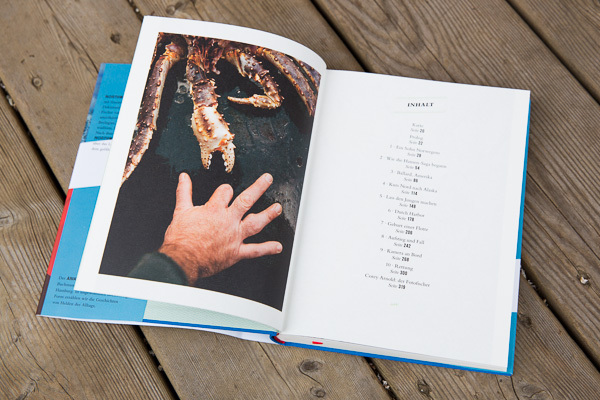 You can buy the book online directly from the publisher here. 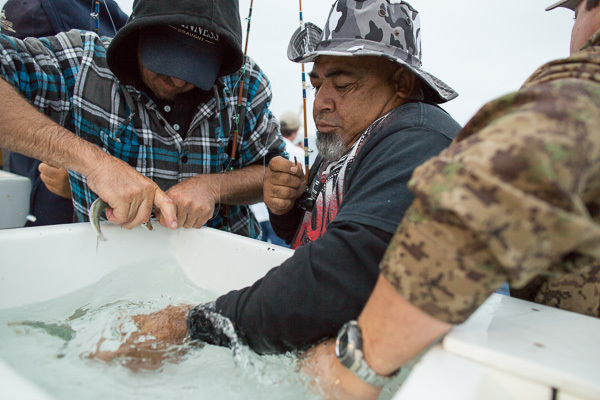 This entry was posted in Fishing Related, Press Reports and tagged ankerherz, bering sea, commercial fishing, crab, crabbing, dangerous, deadliest catch, deutschland, deutsh, discovery, edgar hanson, eric nyhammer, fishing, northwestern, ocean, rollo, sea, Sig Hanson. 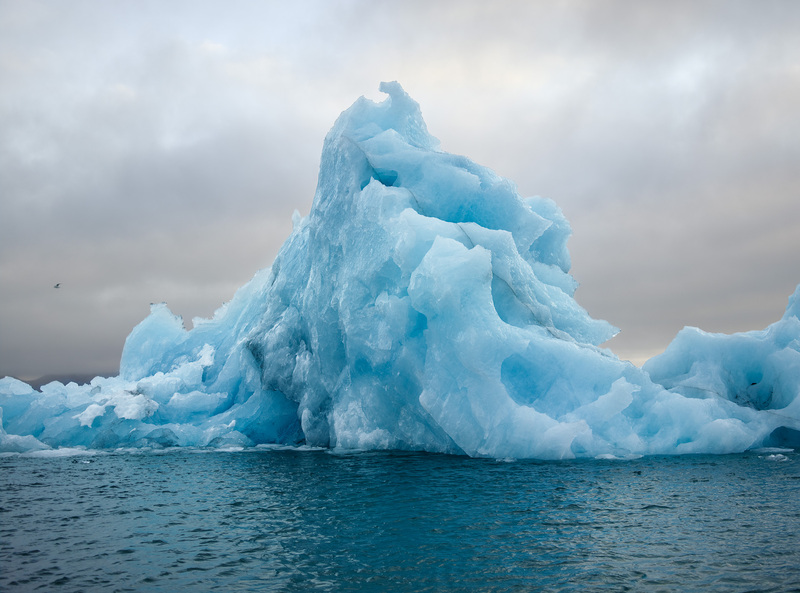 On the wall thru May 19th at the Haggerty Museum of Art at Marquette University in Wisconsin is a beautiful curation of images that includes my print “The North Sea” 39×56 inches. 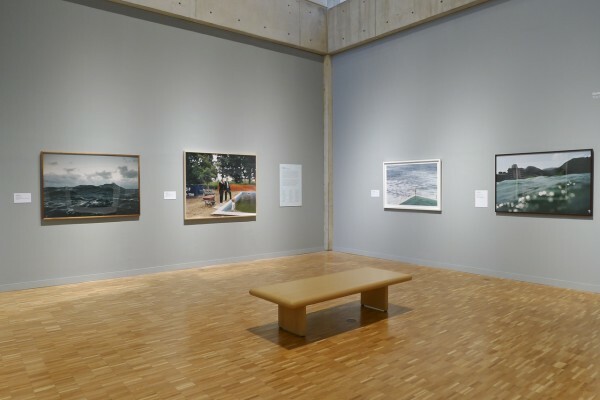 The install shot is pictured below next to photographs by Tina Barney, Carlo Van de Roer, and Asako Narahashi. This entry was posted in Art Shows, Fishing Related, Press Reports and tagged artists, exhibition, gallery, ocean, photographer, photography, sea, wisconsin. 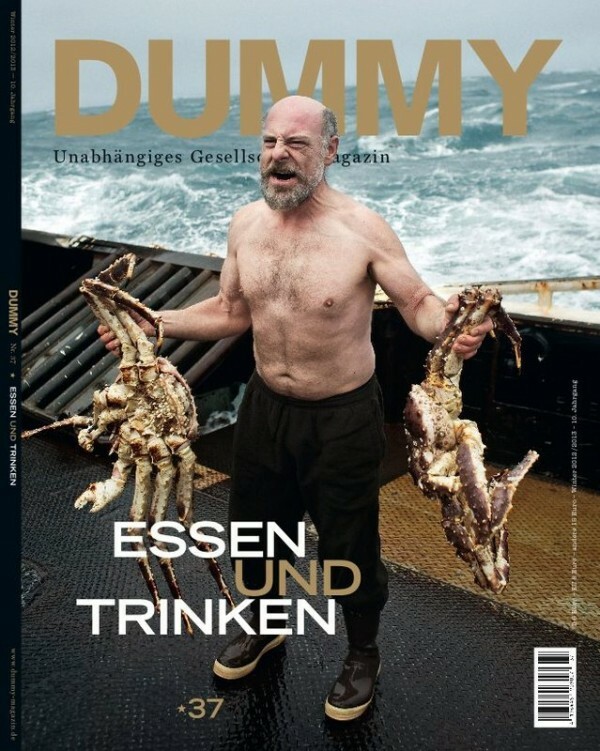 This month I’ve got the cover and a 15 page spread of Fish-Work images in the German art and culture magazine named Dummy #37. Thanks to Brian Greer, the engineer of the f/v Rollo, who has once again shown up on a magazine cover without his permission:). I have no idea how the writing is but this is a beautiful magazine and I’m really happy with how the spreads turned out. Thanks. 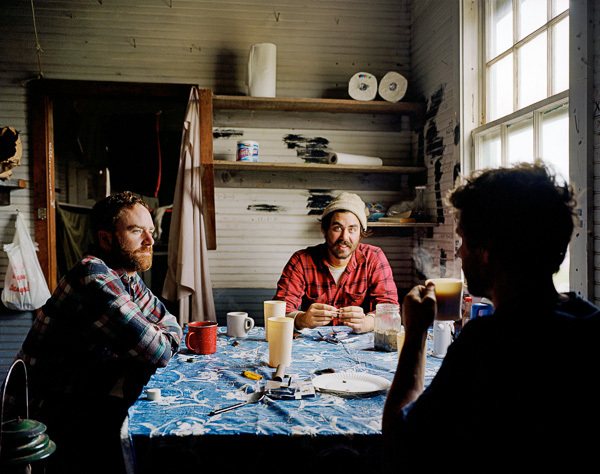 Also included in the mag is work from Chris Jordan. Amazing and disturbing images of Albatross carcasses found on Midway atoll that were completely filled with discarded plastic bits. 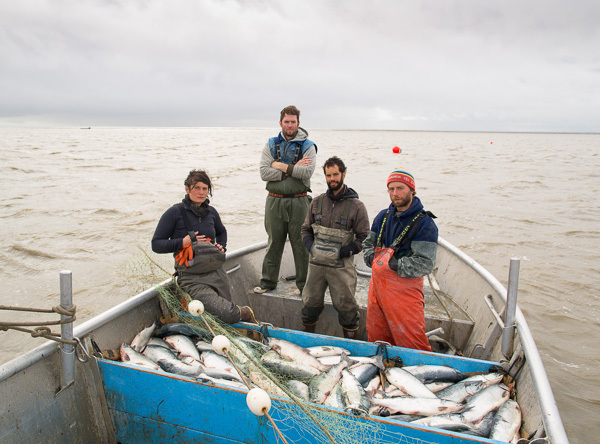 This entry was posted in Fishing Related, Press Reports and tagged adventure, Alaska, bering, brian, catch, coreyfishes, crab, crabbing, deadliest, Europe, fisherman, fishermen, fishing, greer, king, magazin, photographer, photography, sea, TV. 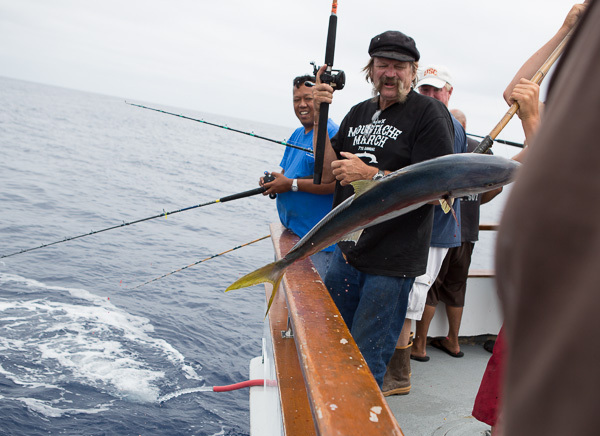 I grew up near San Diego, California and spent my early years obsessively sportfishing with my dad. 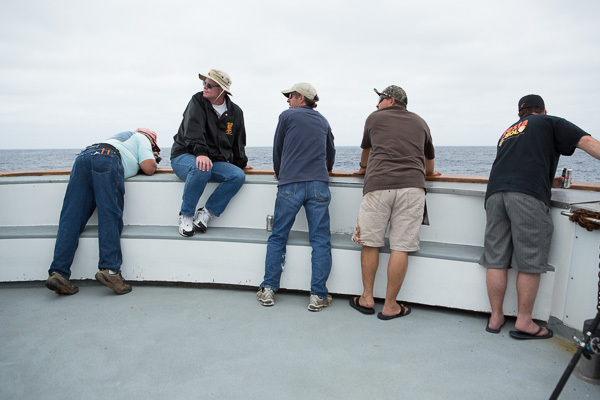 When the tuna were in, we’d often book trips on “party boats” out of San Diego which consist of about 30 or so guys drinking a lot of beer and fishing nonstop for 16 hours in a day. 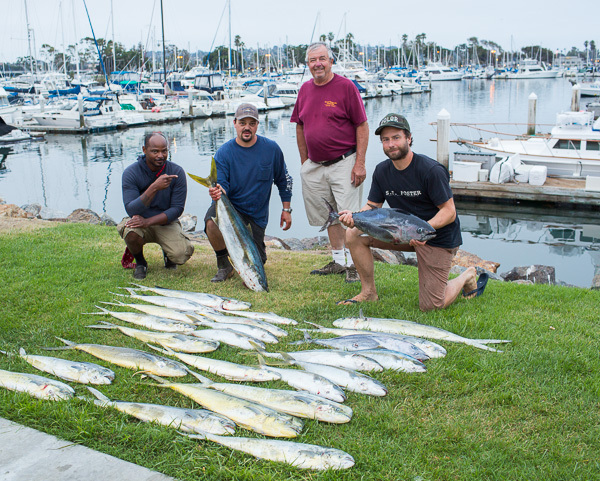 It had been a long while since I’d thrown a sardine on a kelp patty, and so last August, my dad and I along with my childhood best friend Nathan Thiele, and my buddy Frank Banks set out to sea on a 1.5 day trip into Mexican waters about the f/v Legend out of Seaforth Landing. 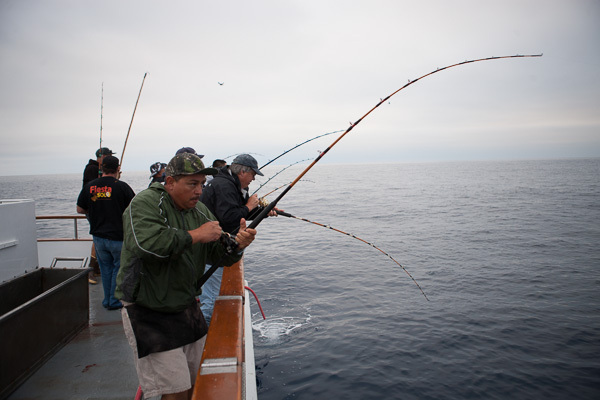 The trip ended up being one of the best party boat experiences of my life with nonstop Dorado, Yellowtail, and Bluefin Tuna flying over the rail. My freezer is still packed with filets. 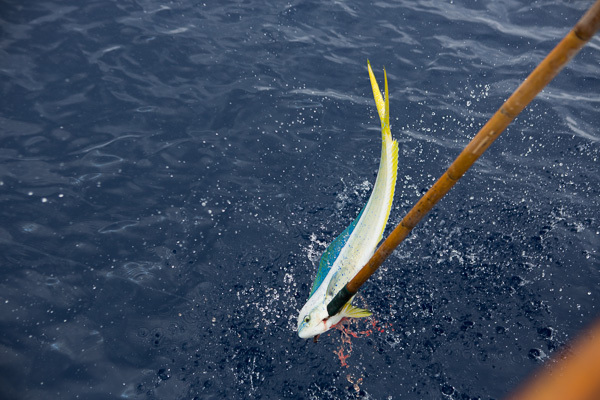 Fishing for Mahi Mahi, Bluefin Tuna, and Yellowtail works like this: This time of year, we were fishing around 50 miles offshore in Mexican waters. 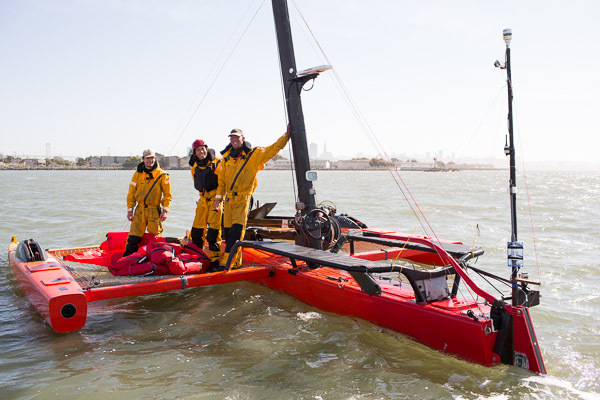 You basically troll around at 8 knots or so in search of kelp patties. 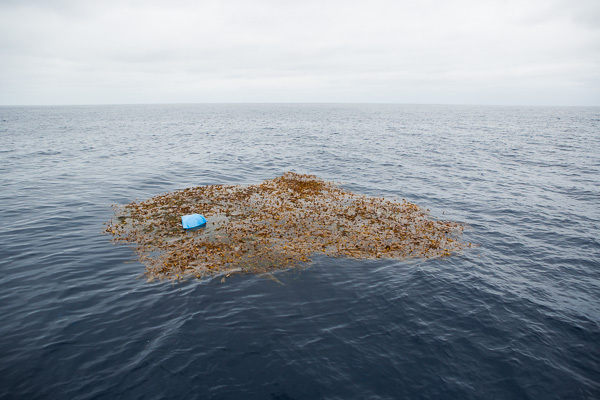 Patties are large rafts of dead kelp that have broken away from inshore waters. Beneath these floating shelters may live a who school of fish that are following warm water currents heading North. 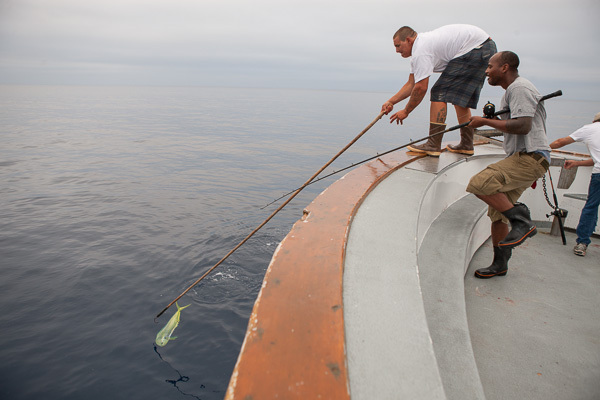 Its pretty exciting to slide up to a patty, and throw a live bait in the water. You never know what might be down there. On our first patty, everyone on the boat hooked up at once! It was amazing. 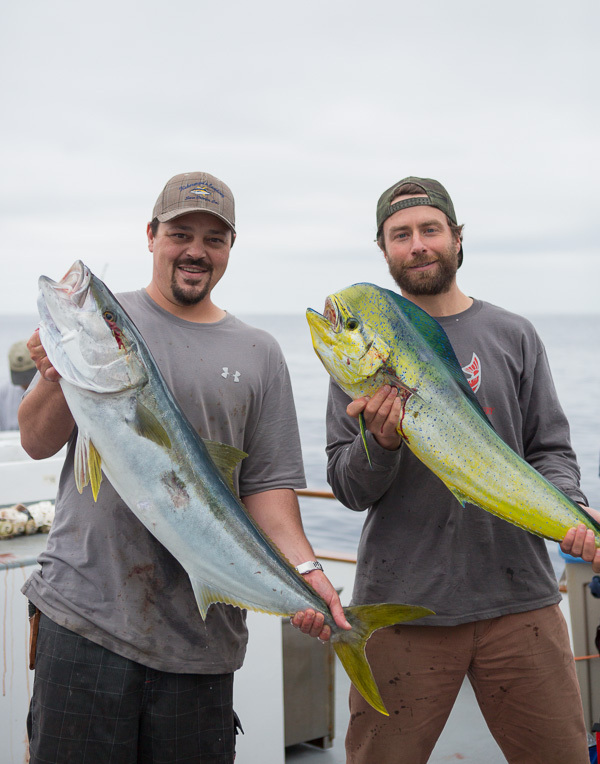 Mahi and Yellowtail bloodied the decks in every direction. The rest of the day went like this. Every patty we stopped on held fish. So many, that we would only stay on patties that held larger fish. Nice to reunite with my fishing buddy, Nathan Thiele. We hadn’t fished together since the 80’s. Similarly great to reunite on a boat with my dad. This guy was some kind of Mustache champion. 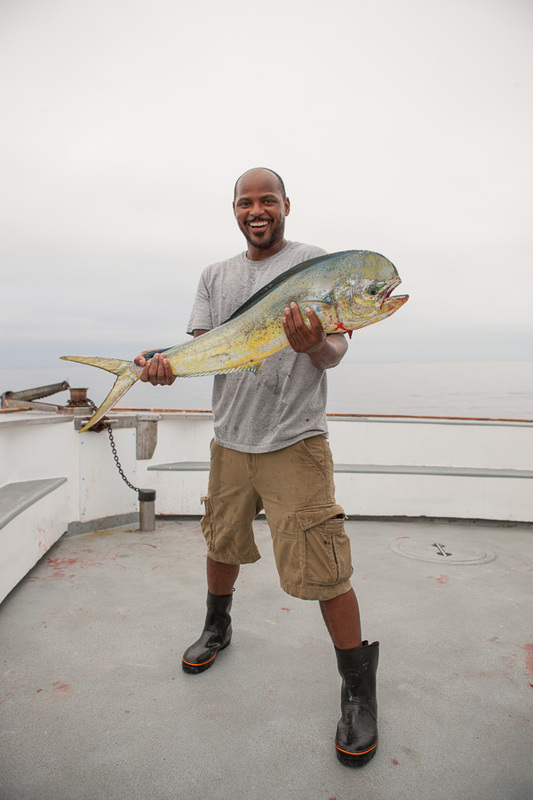 He also could not stop catching the biggest fish on the boat. 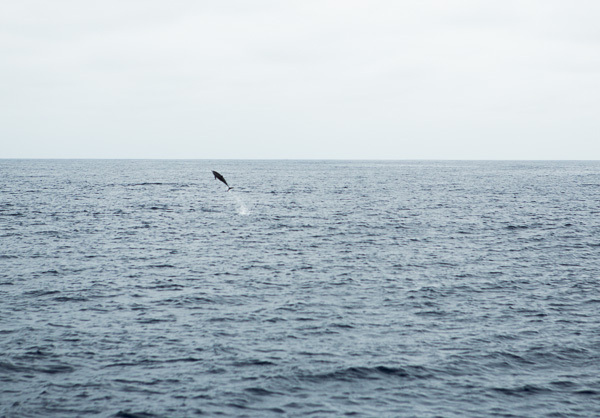 Sometime after dark we found the coveted Bluefin Tuna hangout and Ahi started flying over the rail. I landed two of them which was icing on the cake. 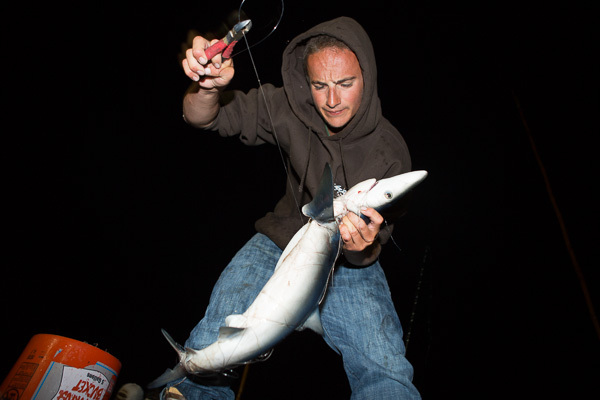 Don’t be alarmed, this shark made it back in the water alive. Those things are mighty resilient. Nathan and I had 27 fish between just the two of us. Such an amazing trip. 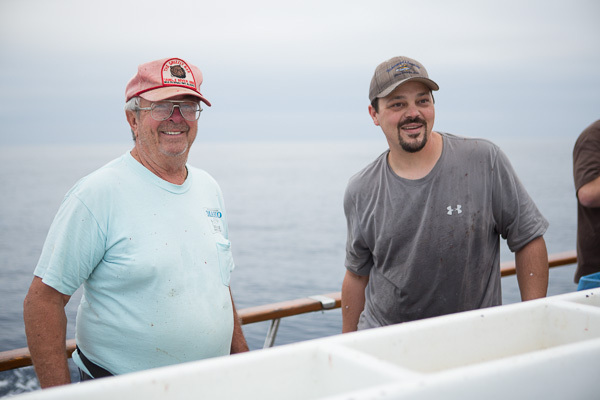 Thanks to the fine captain and crew of the f/v Legend and Frank at FishFeed for sponsoring the trip. We’ll be back next year for sure! 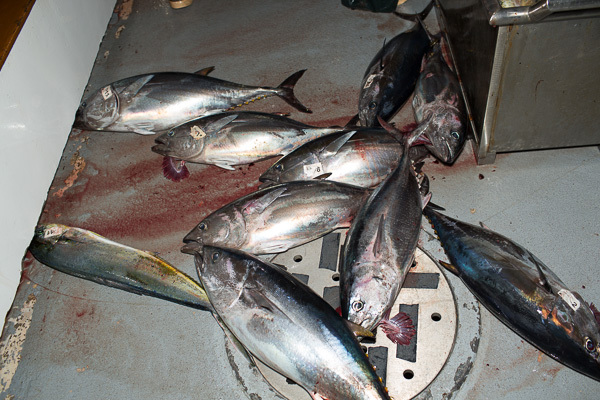 This entry was posted in assignments, At Sea Journal, Fishing Related and tagged ahi, Bluefin, catch, charter, deadliest, dorado, Feed, fish, landing, legend, mexico, ocean, overfishing, pacific, photographs, photography, photos, Seaforth, trip. This entry was posted in Art Shows, Press Reports. A while back, my “Swans are Evil” image was printed on the cover of the Portland Mercury. Now you can grab a small print online for a good cause here. 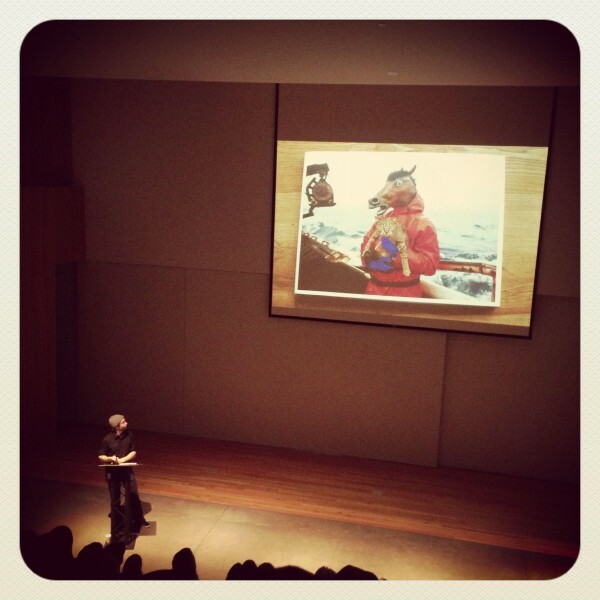 Thanks to everyone who came out to hear me spill the beans on my photo/fishing life at the Portland Creative Mornings lecture series two weeks ago. Fun times, good people, beautiful space! They’ve just posted a video of the whole lecture online (yikes!). You can find it here. This entry was posted in New Pictures and tagged art, catch, fisherman, lecture, life story, photo, photography, slideshow, story, storytelling, talk. Andy Adams (Flak Photo), probably the most meticulous and passionate photo community organizer on the web, has been up to great things lately. 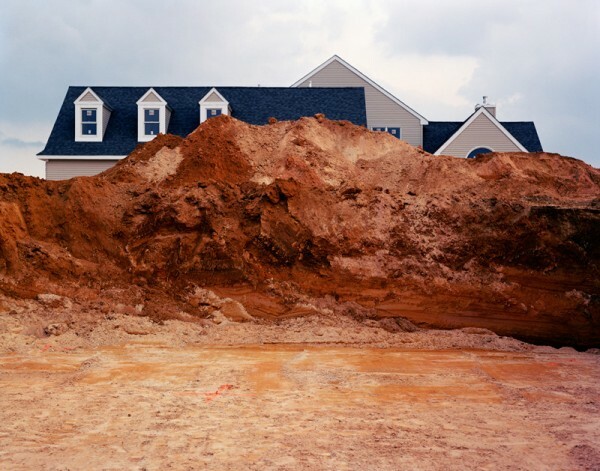 He has curated an online exhibition of new landscape photographs entitled Looking at the Land, 21st Century American Views, a collaboration with the Museum of Art, Rhode Island School of Design that has been featured on TIME Lightbox, PetaPixel, projected at RISD, printed and hung at Fotoweek D.C. and likely getting more attention as we speak. I’m grateful to have been included. There are some gems in this collection, particularly these three. 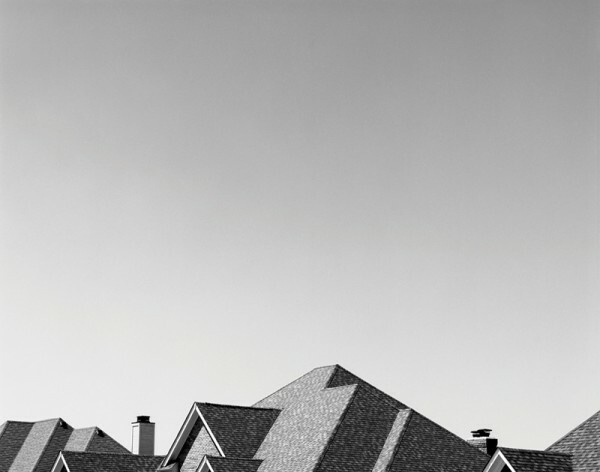 I’m not quite sure why I’m drawn to missing suburban houses but I could take a guess. 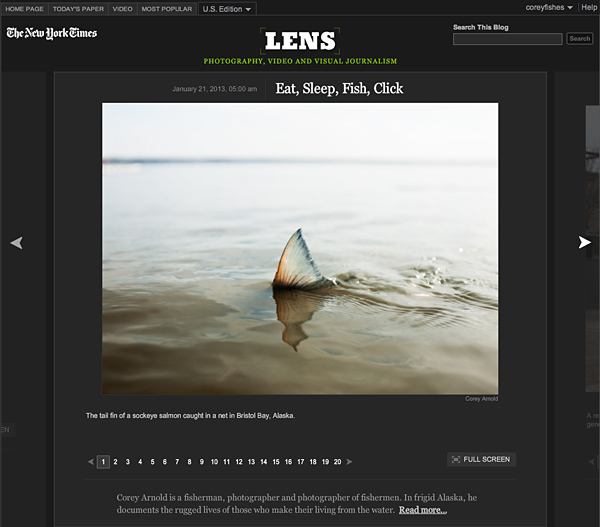 This entry was posted in Other Artists/Photographers, Press Reports and tagged corey arnold, coreyfishes, landscape, photography. Vice Magazine featured a six page spread of my Graveyard Point series in the October issue and just launched a little web gallery of the work online here. 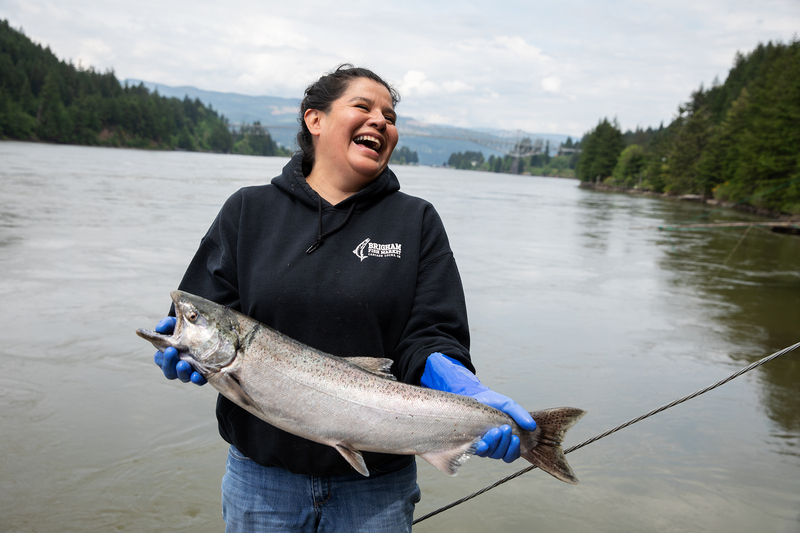 This entry was posted in Awards/ Honors, New Pictures, Press Reports and tagged Alaska, arnold, art, bering sea, boat, Bristol Bay, catch, commercial, deadliest catch, discovery, fish, fisherman, fishing, graveyard point, interview, magazine, photo, photography, pictures, salmon, sea.